The Lowdown: Hugh Jackman has managed to deepen his signature character yet again in this dark, violent depiction of a weakened, vulnerable Wolverine (supported by equally fine work from Patrick Stewart as an ailing Professor X). Gritty barely begins to describe Logan, the third solo Wolverine outing and the second directed by James Mangold. While Mangold’s The Wolverine (2013) was a dramatic improvement over director Gavin Hood’s X-Men Origins: Wolverine (2009), it managed to get bogged down in hoary “comic book movie” cliches as it progressed to a ho-hum climax involving one of the lamest villains in the X-Men movie series, Viper. If those earlier movies seem like a hazy memory (or if you missed them altogether), fear not—Logan works well as a (mostly) standalone outing. A passing familiarity with the character (and X-Men lore in general) is definitely helpful, but one needn’t be an X-Men junkie to enjoy it. After Fox’s mega-hit with the decidedly adult-oriented Deadpool, the studio apparently gave Mangold free reign to unleash Wolvie’s adamantium claws with a brutal fury we’ve never seen before onscreen. The year is 2029 and the mutants of X-Men adventures past have mostly died off. 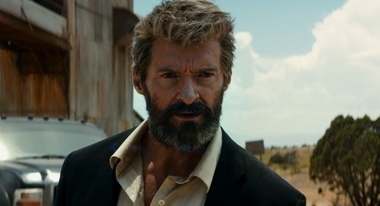 Logan (Hugh Jackman) lives a low-key life in a Southern border town, working as a limo driver of all things. Clearly he’s not well physically, moving with a strained, lopsided gait. He no longer heals instantly following injury; scars cover his body, puss festers at the knuckle-slits through with his claws emerge. To deal with the obvious pain (both physical and mental; only Logan remembers all the pre-Days of Future Past events), Logan has been hitting the bottle pretty hard. Along with surviving mutant Caliban (Stephen Merchant), Logan is holed up in the shell of an abandoned industrial complex just south of the Mexican border. 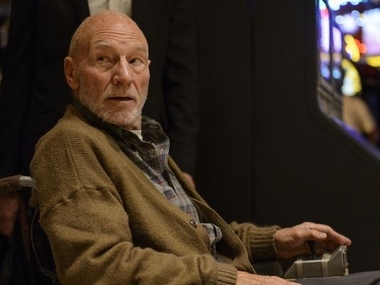 They’re trying to maintain a measure of comfort for Charles Xavier (Patrick Stewart) as he slowly succumbs to what appears to be Alzheimer’s. Again, it’s gritty stuff. Mangold has allowed these once-indomitable heroes to be seen in the winter of their lives. And it’s not pretty. Logan has a solemn weightiness uncommon for superhero films. The adrenaline-fueled action (of which there is still plenty) carries an extra sting knowing how vulnerable these heroes have become. 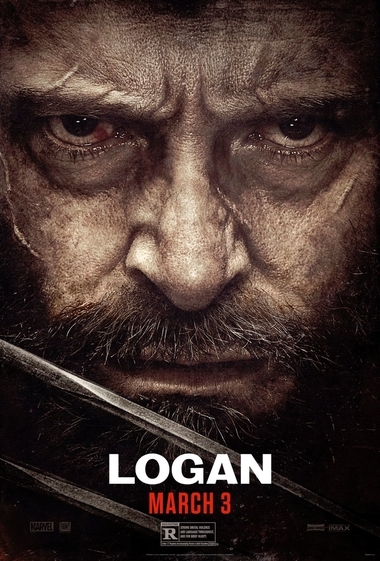 Mangold fuses elements of classic Westerns and road movies as Wolverine and Professor X strive to protect a young girl, Laura (Dafne Keen), from the cybernetics organization Transigen. Laura turns out to be a mutant, which comes as a shock to Logan since it was believed none had been born in some 25 years. Though Xaiver’s telepathic powers have largely slipped from his control (when not medicated, his unchecked mind paralyzes everyone around him—putting all lives at stake), he recognizes the importance of Laura as a beacon of hope for the future of mutant-kind. As Logan learns the details of her horrifying backstory, he can’t ignore the startling similarities between himself and the girl. Newcomer Dafne Keen is sensational as the nearly-feral Laura. It’s hard to think of another pre-teen actor who has ever come close to delivering the physical ferocity displayed here by Keen. Laura, if anything, is even more vicious than Logan as she attempts to exorcise personal demons accumulated over her short life as a lab rat. Jackman and Stewart both deliver character-redefining performances in what are purported to be their respective swan songs in these roles. In his 17 years with the claws, Jackman has starred as Logan seven times (plus cameo’ed twice). He’s deepened the character just about every time out, always mining Logan’s tortured psyche for additional nuance. It’s an accomplishment unmatched in the genre and if this is indeed his final time, he will be sorely missed (and I don’t envy whoever eventually steps into the role in a future reboot—no other comic book hero has been so thoroughly defined by a single actor). Avengers empire) has come to the harsh “realism” (relatively speaking) of Christopher Nolan’s Dark Knight trilogy. The R-rating allows Mangold to take the violence and language far beyond even Nolan’s work. And that’s where Logan manages to hit a few snags. The rampant dismemberment and various brutality would’ve possibly worked better on a slightly more restrained level. The film would’ve still easily earned its R with half the blood and gore. Over the course of a lengthy 137 minutes, the violence has a numbing effect, becoming increasingly routine instead of ramping up the way I think Mangold intended. On the other hand, maybe that cynical, “no one here gets out alive” (numerous innocent supporting characters are rather callously disposed of), slash ‘n’ burn nihilism was exactly what Mangold sought to establish. No post-credits tease—Mangold clearly wants Logan to stand on its own, closing the door on James “Logan” Howlett with a poignant final image.